Xiaomi is launching the Redmi 5 on December 7. The phone will arrive in four colors and most of its specs are already known thanks to a TENAA listing. 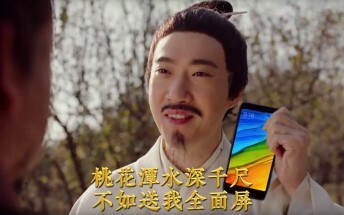 Now, a leaked Chinese commercial lets us see the phone in action. The video is set in a sanctuary where the main protagonists are always arguing. Our knowledge of Chinese is scarce, but what is more important is we see the star of the promo the Xiaomi Redmi 5. From what is seen, the Xiaomi Redmi 5 will indeed have a tall screen and no home button. The clip appears to be three stitched adverts in one video, separated by the sign “Redmi 5/ Redmi 5 Plus. A phone for a thousand” along with the launch date December 7. This is when everything will be made official - from specs to pricing and availability.